Fully automatic Cap Tightening / Retorqueing Machine requires only 32" of line space. Ideal for Pump & Trigger Cap Tightening and Retourquing after heat induction sealing. Portability allows versatility for automatic capping; easily moved from one production line to another. Handles metal, glass, or plastic containers from low jars and vials up to 2-1/2 gallons. Two full-year guarantee on all parts. Stainless steel 7’6” conveyor frame DC variable speed drive with a 4 1/2” wide Delrin chain with stainless steel pins, stainless steel drive and idler shafts with patented reinforced nylon and stainless steel conveyor rail posts, stainless steel conveyor end guards and non-corrosive drive and idler conveyor top chain sprockets (left to right travel standard). Note: (Machine also can be purchased without conveyor). 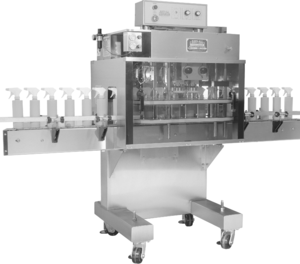 Stainless steel enclosure with Lexan doors on front and back enclosing spindle and gripper section down to conveyor. Patented design eliminates need for changeover parts for a wide range of standard caps, container shapes and sizes. Calibrated settings allow for ease and repeatability of changeovers. Stainless steel guarding of upper drive section. One pair of stainless steel bottle gripper belt housings complete with belts and drives. All stainless steel bottle gripper belt and spindle shafting. Heavy duty patented multiple disc adjustable torque clutches which will give a consistent torque and minimize wear on cap tightening discs (two pair). All electronically controlled variable speed drives for ease of adjustments. All Nema 12 electrical components. Portable on four swivel wheels for easy maneuvering. Mounting facilities provided for using a second set of bottle gripper belts. One piece solid welded construction cabinet epoxy painted for both cleanliness and easy maintenance. Stainless steel machine leveling screws with floor pads. All parts modularized for quick replacement. Little to no tools required. All stainless steel bolts and fasteners throughout. - Retourquing after heat induction sealing. - Minimal Air required for pneumatic clutch option.